For interference in radio communications, see Interference (communication). "Interference pattern" redirects here. For Moiré patterns, see Moiré pattern. The interference of two waves. When in phase, the two lower waves create constructive interference (left), resulting in a wave of greater amplitude. When 180° out of phase, they create destructive interference (right). In physics, interference is a phenomenon in which two waves superpose to form a resultant wave of greater, lower, or the same amplitude. Constructive and destructive interference result from the interaction of waves that are correlated or coherent with each other, either because they come from the same source or because they have the same or nearly the same frequency. Interference effects can be observed with all types of waves, for example, light, radio, acoustic, surface water waves, gravity waves, or matter waves. The resulting images or graphs are called interferograms. Interference of waves from two point sources. Cropped tomography scan animation of laser light interference passing through two pinholes (side edges). The principle of superposition of waves states that when two or more propagating waves of same type are incident on the same point, the resultant amplitude at that point is equal to the vector sum of the amplitudes of the individual waves. If a crest of a wave meets a crest of another wave of the same frequency at the same point, then the amplitude is the sum of the individual amplitudes—this is constructive interference. If a crest of one wave meets a trough of another wave, then the amplitude is equal to the difference in the individual amplitudes—this is known as destructive interference. A magnified image of a coloured interference pattern in a soap film. The "black holes" are areas of almost total destructive interference (antiphase). Constructive interference occurs when the phase difference between the waves is an even multiple of π (180°) , whereas destructive interference occurs when the difference is an odd multiple of π. If the difference between the phases is intermediate between these two extremes, then the magnitude of the displacement of the summed waves lies between the minimum and maximum values. Consider, for example, what happens when two identical stones are dropped into a still pool of water at different locations. Each stone generates a circular wave propagating outwards from the point where the stone was dropped. When the two waves overlap, the net displacement at a particular point is the sum of the displacements of the individual waves. At some points, these will be in phase, and will produce a maximum displacement. In other places, the waves will be in anti-phase, and there will be no net displacement at these points. Thus, parts of the surface will be stationary—these are seen in the figure above and to the right as stationary blue-green lines radiating from the centre. Interference of light is a common phenomenon that can be explained classically by the superposition of waves, however a deeper understanding of light interference requires knowledge of wave-particle duality of light which is due to quantum mechanics. Prime examples of light interference are the famous double-slit experiment, laser speckle, anti-reflective coatings and interferometers. Traditionally the classical wave model is taught as a basis for understanding optical interference, based on the Huygens–Fresnel principle. and df is known as the fringe spacing. The fringe spacing increases with increase in wavelength, and with decreasing angle θ. The fringes are observed wherever the two waves overlap and the fringe spacing is uniform throughout. Optical interference between two point sources that have different wavelengths and separations of sources. A point source produces a spherical wave. If the light from two point sources overlaps, the interference pattern maps out the way in which the phase difference between the two waves varies in space. This depends on the wavelength and on the separation of the point sources. The figure to the right shows interference between two spherical waves. The wavelength increases from top to bottom, and the distance between the sources increases from left to right. When the plane of observation is far enough away, the fringe pattern will be a series of almost straight lines, since the waves will then be almost planar. Interference occurs when several waves are added together provided that the phase differences between them remain constant over the observation time. It is sometimes desirable for several waves of the same frequency and amplitude to sum to zero (that is, interfere destructively, cancel). This is the principle behind, for example, 3-phase power and the diffraction grating. In both of these cases, the result is achieved by uniform spacing of the phases. The Fabry–Pérot interferometer uses interference between multiple reflections. A diffraction grating can be considered to be a multiple-beam interferometer; since the peaks which it produces are generated by interference between the light transmitted by each of the elements in the grating; see interference vs. diffraction for further discussion. Creation of interference fringes by an optical flat on a reflective surface. Light rays from a monochromatic source pass through the glass and reflect off both the bottom surface of the flat and the supporting surface. The tiny gap between the surfaces means the two reflected rays have different path lengths. In addition the ray reflected from the bottom plate undergoes a 180° phase reversal. As a result, at locations (a) where the path difference is an odd multiple of λ/2, the waves reinforce. At locations (b) where the path difference is an even multiple of λ/2 the waves cancel. Since the gap between the surfaces varies slightly in width at different points, a series of alternating bright and dark bands, interference fringes, are seen. where A represents the magnitude of the displacement, φ represents the phase and ω represents the angular frequency. Thus, the interference pattern maps out the difference in phase between the two waves, with maxima occurring when the phase difference is a multiple of 2π. If the two beams are of equal intensity, the maxima are four times as bright as the individual beams, and the minima have zero intensity. The two waves must have the same polarization to give rise to interference fringes since it is not possible for waves of different polarizations to cancel one another out or add together. Instead, when waves of different polarization are added together, they give rise to a wave of a different polarization state. The discussion above assumes that the waves which interfere with one another are monochromatic, i.e. have a single frequency—this requires that they are infinite in time. This is not, however, either practical or necessary. Two identical waves of finite duration whose frequency is fixed over that period will give rise to an interference pattern while they overlap. Two identical waves which consist of a narrow spectrum of frequency waves of finite duration, will give a series of fringe patterns of slightly differing spacings, and provided the spread of spacings is significantly less than the average fringe spacing, a fringe pattern will again be observed during the time when the two waves overlap. Conventional light sources emit waves of differing frequencies and at different times from different points in the source. If the light is split into two waves and then re-combined, each individual light wave may generate an interference pattern with its other half, but the individual fringe patterns generated will have different phases and spacings, and normally no overall fringe pattern will be observable. However, single-element light sources, such as sodium- or mercury-vapor lamps have emission lines with quite narrow frequency spectra. When these are spatially and colour filtered, and then split into two waves, they can be superimposed to generate interference fringes. All interferometry prior to the invention of the laser was done using such sources and had a wide range of successful applications. A laser beam generally approximates much more closely to a monochromatic source, and it is much more straightforward to generate interference fringes using a laser. The ease with which interference fringes can be observed with a laser beam can sometimes cause problems in that stray reflections may give spurious interference fringes which can result in errors. Normally, a single laser beam is used in interferometry, though interference has been observed using two independent lasers whose frequencies were sufficiently matched to satisfy the phase requirements. This has also been observed for widefield interference between two incoherent laser sources. White light interference in a soap bubble. The iridescence is due to thin-film interference. It is also possible to observe interference fringes using white light. A white light fringe pattern can be considered to be made up of a 'spectrum' of fringe patterns each of slightly different spacing. If all the fringe patterns are in phase in the centre, then the fringes will increase in size as the wavelength decreases and the summed intensity will show three to four fringes of varying colour. Young describes this very elegantly in his discussion of two slit interference. Since white light fringes are obtained only when the two waves have travelled equal distances from the light source, they can be very useful in interferometry, as they allow the zero path difference fringe to be identified. To generate interference fringes, light from the source has to be divided into two waves which have then to be re-combined. Traditionally, interferometers have been classified as either amplitude-division or wavefront-division systems. In an amplitude-division system, a beam splitter is used to divide the light into two beams travelling in different directions, which are then superimposed to produce the interference pattern. The Michelson interferometer and the Mach–Zehnder interferometer are examples of amplitude-division systems. In wavefront-division systems, the wave is divided in space—examples are Young's double slit interferometer and Lloyd's mirror. Interference can also be seen in everyday phenomena such as iridescence and structural coloration. 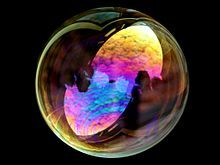 For example, the colours seen in a soap bubble arise from interference of light reflecting off the front and back surfaces of the thin soap film. Depending on the thickness of the film, different colours interfere constructively and destructively. Interferometry has played an important role in the advancement of physics, and also has a wide range of applications in physical and engineering measurement. Thomas Young's double slit interferometer in 1803 demonstrated interference fringes when two small holes were illuminated by light from another small hole which was illuminated by sunlight. Young was able to estimate the wavelength of different colours in the spectrum from the spacing of the fringes. The experiment played a major role in the general acceptance of the wave theory of light. In quantum mechanics, this experiment is considered to demonstrate the inseparability of the wave and particle natures of light and other quantum particles (wave–particle duality). Richard Feynman was fond of saying that all of quantum mechanics can be gleaned from carefully thinking through the implications of this single experiment. The results of the Michelson–Morley experiment are generally considered to be the first strong evidence against the theory of a luminiferous aether and in favor of special relativity. Interferometry has been used in defining and calibrating length standards. When the metre was defined as the distance between two marks on a platinum-iridium bar, Michelson and Benoît used interferometry to measure the wavelength of the red cadmium line in the new standard, and also showed that it could be used as a length standard. Sixty years later, in 1960, the metre in the new SI system was defined to be equal to 1,650,763.73 wavelengths of the orange-red emission line in the electromagnetic spectrum of the krypton-86 atom in a vacuum. This definition was replaced in 1983 by defining the metre as the distance travelled by light in vacuum during a specific time interval. Interferometry is still fundamental in establishing the calibration chain in length measurement. Interferometry is used in the calibration of slip gauges (called gauge blocks in the US) and in coordinate-measuring machines. It is also used in the testing of optical components. 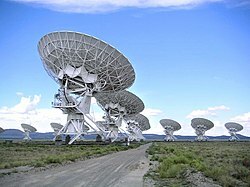 The Very Large Array, an interferometric array formed from many smaller telescopes, like many larger radio telescopes. In 1946, a technique called astronomical interferometry was developed. Astronomical radio interferometers usually consist either of arrays of parabolic dishes or two-dimensional arrays of omni-directional antennas. All of the telescopes in the array are widely separated and are usually connected together using coaxial cable, waveguide, optical fiber, or other type of transmission line. Interferometry increases the total signal collected, but its primary purpose is to vastly increase the resolution through a process called Aperture synthesis. This technique works by superposing (interfering) the signal waves from the different telescopes on the principle that waves that coincide with the same phase will add to each other while two waves that have opposite phases will cancel each other out. This creates a combined telescope that is equivalent in resolution (though not in sensitivity) to a single antenna whose diameter is equal to the spacing of the antennas furthest apart in the array. An acoustic interferometer is an instrument for measuring the physical characteristics of sound wave in a gas or liquid. It may be used to measure velocity, wavelength, absorption, or impedance. A vibrating crystal creates the ultrasonic waves that are radiated into the medium. The waves strike a reflector placed parallel to the crystal. The waves are then reflected back to the source and measured. are the probability amplitude coefficients, which are complex numbers. intermediate "alternatives". These are consequently known as the quantum interference terms, or cross terms. This is a purely quantum effect and is a consequence of the non-additivity of the probabilities of quantum alternatives. ^ Ockenga, Wymke. Phase contrast. Leika Science Lab, 09 June 2011. "If two waves interfere, the amplitude of the resulting light wave will be equal to the vector sum of the amplitudes of the two interfering waves." ^ Pfleegor, R. L.; Mandel, L. (1967). "Interference of independent photon beams". Phys. Rev. 159 (5): 1084–1088. Bibcode:1967PhRv..159.1084P. doi:10.1103/physrev.159.1084. ^ Patel, R.; Achamfuo-Yeboah, S.; Light R.; Clark M. (2014). "Widefield two laser interferometry". Optics Express. 22 (22): 27094–27101. Bibcode:2014OExpr..2227094P. doi:10.1364/OE.22.027094. PMID 25401860. ^ a b Max Born and Emil Wolf, 1999, Principles of Optics, Cambridge University Press, Cambridge. ^ Greene, Brian (1999). The Elegant Universe: Superstrings, Hidden Dimensions, and the Quest for the Ultimate Theory. New York: W.W. Norton. pp. 97–109. ISBN 978-0-393-04688-5. ^ RS Longhurst, Geometrical and Physical Optics, 1968, Longmans, London. ^ Wojciech H. Zurek (2003). "Decoherence, einselection, and the quantum origins of the classical". Reviews of Modern Physics. 75 (3): 715. arXiv:quant-ph/0105127. Bibcode:2003RvMP...75..715Z. doi:10.1103/revmodphys.75.715. Look up interference in Wiktionary, the free dictionary. Wikimedia Commons has media related to Interference.